BBC South East, BBC Radio 4 and BBC Sussex have covered the amazing work of PARO the robotic seal following a seminar attended by over 40 people at the University of Brighton. 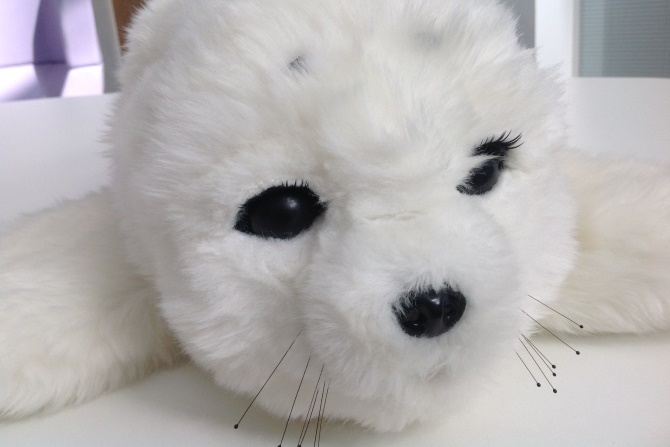 PARO is a robot in the shape of a baby harp seal and it’s changing the lives of people with dementia. PARO was invented by Professor Takanori Shibata in Japan. The fluffy, cuddly seal is covered all over in sensors and responds to both touch and the sound of the human voice. Dr Penny Dodds, Mental Health Lecturer Practitioner at Sussex Partnership NHS Foundation Trust and the University of Brighton, started the PARO project in 2014. Penny’s role is to coordinate PARO related practice development and research. Penny said: “One person who might be distressed to the point where they may receive medication, where PARO is being used as an alternative to relieve the distress, medication can be avoided. Imogen Campbell is one of the psychology students at Brighton University who has been carrying out research and service evaluation of PARO in practice, focussing on observations of the effect of PARO on communication and engagement with people with dementia. The research aims to help get PARO registered as a medical device so it can be used in the NHS across the country and introduced into everyday practice.